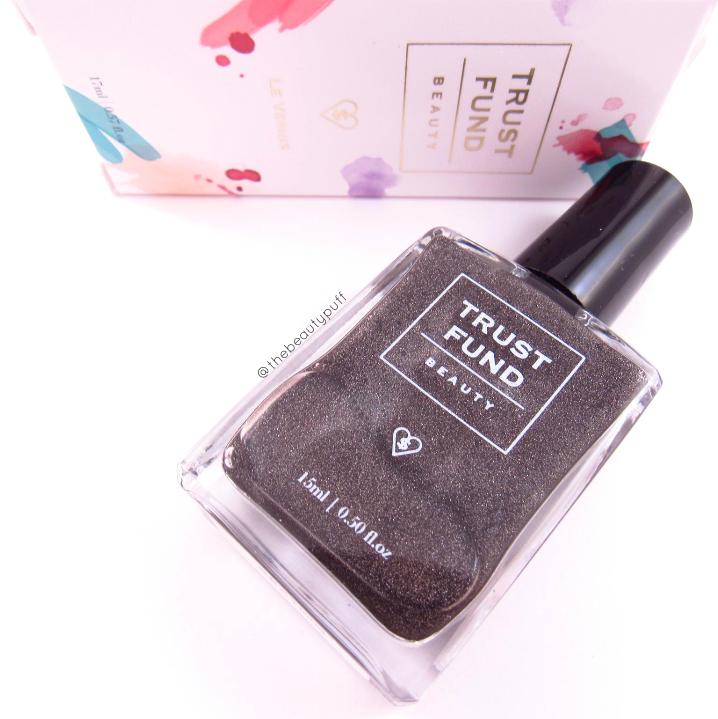 If you haven't guessed by my previous posts featuring Trust Fund Beauty, I absolutely LOVE their polishes. Their formula, color selection and sleek packaging get me every time. 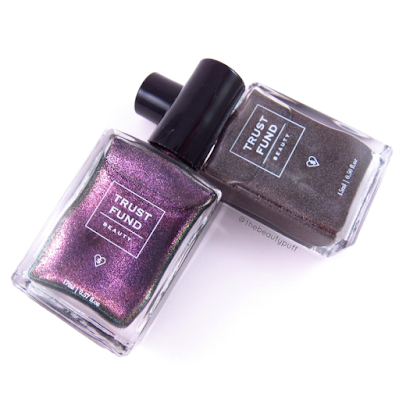 I have featured both cream and glitter finishes before, but today we will look at two stunning shimmery shades - Sexting and Rich Girl Wasted. If the names of these polishes didn't get your attention, the stunning colors certainly will. Sexting, despite its risque name, is a gorgeous, versatile neutral. This shimmery brown lends itself to a multitude of looks and is still eye-catching as the light hits it. I am a neutral lover at heart, but add a little shimmer, and you've got me hooked. I love the look of this polish with solid sweaters to add interest to a classic look. It's a perfect fall shade but it's not so dark that you can't wear it other times of year. Rich Girl Wasted hardly needs an introduction... just LOOK at that duo-chrome. 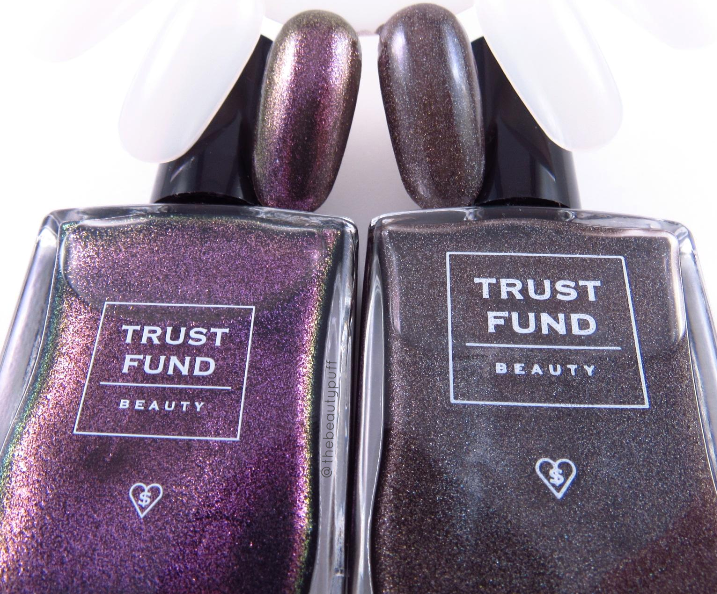 This polish changes with every turn of your hand, reflecting different shades to mesmerize you each time you wear it. While it mainly appears purple, this polish also looks blue and even a bit green at times. Even as I type wearing it, I continue to stare at my nails! At a distance, this polish looks like a dark shimmery purple. So while it is definitely unique, it still coordinates well with a lot of looks. It's a great festive polish for holiday parties as well. Both of these polishes apply smoothly and are relatively thin. For me, three thin coats works best for the most opaque coverage. These polishes don't take long to dry, thankfully, so the extra coat isn't a big deal. This time of year my hands/cuticles get really dry and I need to keep polish on my nails to protect them from getting too damaged. A quick drying polish makes it that much easier to keep up with my at-home manicures. The fact that these polishes are so unique and stunning, makes it even more fun to do my nails. Love. 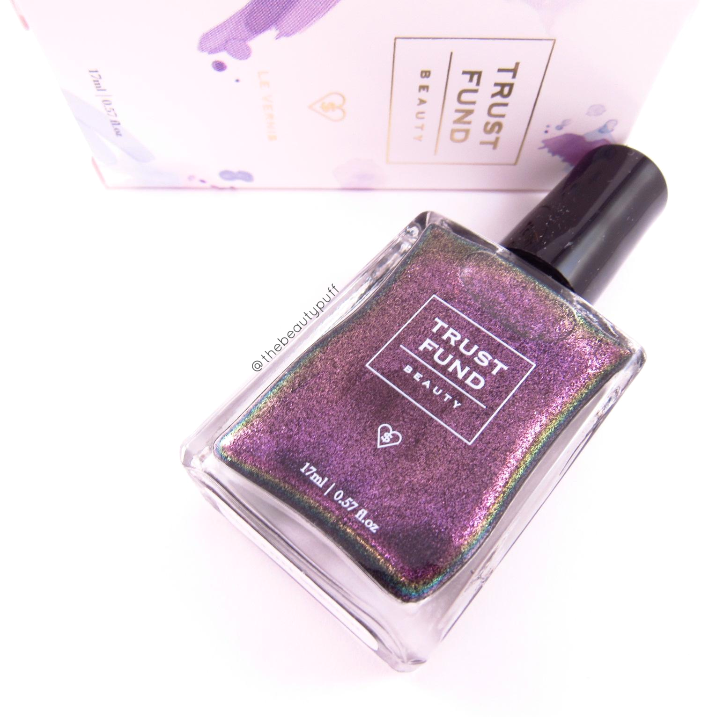 And be sure to follow @trustfundbeauty on Instagram for giveaways, new product releases and of course, daily humor.